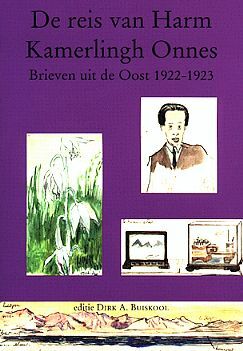 Harm Kamerlingh Onnes wrote long letters to his family in Holland illustrated by numerous sketches. These letters afford us an insight into the colonial world of Indonesia and Eastern Asia at its apogee in the 1920’s . The letters provide an added dimension by the glimpse we are given of the business empire of the famous ‘Majoor der Chineezen’ Tjong A Fie” in Medan. In December 1922 Harm and his Uncle Dolf left Amsterdam for Genoa where they boarded the liner ‘Vondel’ bound for the Netherlands Indies. It was the first time that Harm made the voyage but Dolf had made the journey fifteen times before. They sailed via Port Said through the Suez Canal, Aden and Colombo to Sumatra. During the trip Harm wrote extensively to his family about life on board of the ship, illustrated by remarkably accurate sketches of his fellow passengers. Harm himself was particularly impressed by Mrs. Tip, enthraled by her delightful piano playing. They visited Sabang and a week later the ship arrived in Belawan, the port of Medan where Harm and DoIf disembarked. Dolf owned the well-known firm ‘Administratie Kantoor Kamerlingh 0nnes’ in Medan Besides managing his own firm, Dolf was responsible for the business affairs of the late Tjong A Fie who had died two years earlier Tjong A Fie doyen of the Chinese community and one of the most remarkable among the prominent names in these colonie, employed over ten thousand people in his business empire making him one of the wealthiest and most influential Chinese in the whole of Sumatra. In Medan Harm and Dolf met Tjong A Fie’s widow and visited the late entrepreneurs plantations. The letters provide a good impression of Dolf’s business dealings, transactions, financial and legal problems. Harm described his unde as a kind of business tycoon who won all his cases, which was by and large true. We meet Uncle Dolf’s social circle, his friends and bridge partners, and become acquainted with their drinking habits. Harrm and Dolf went to many films like Charlie Chaplin’s The Idle Class’s, the Three Musketeers and other classics of the twenties. They attended concerts, exhibitions and social gatherings in the city of Medan as well as elsewhere in the region. After having spent two months there, in which they even made a ‘rafting trip’ on a jungle river Harm and Dolf left Medan for Penang From there the two sailed via Singapore to Amoy on the south coast of China Where they met Mr. Lim Nee Kar, one of Tjong A Fie’s important business contacts. In Swatow they visited the Tjongs’s ancestral house which had already fallen into a state of decay. Harm and Dolf also inspected the poorly managed private railway belonging to the Tjong family which ran between Swatow and Chao Chow. From Swatow they sailed to Shanghai and from there to Peking, where they met Tjong A Foek (Queeny) Chang), Tjong A Fie’s eldest daughter and her husband Lim King Yin (son of Lim Nee Kar). While in Peking Harm made many site seeing trips to the Forbidden Palace and other tourist attractions of the city with A Foek. From Peking Harm and Dolf left for Japan to meet other business contacts of Tjong A Fie. After about three weeks in Kyoto, Kobe, Tokyo, and Nagasaki they sailed back to Holland. Harm never returned to the Far East, nor did Dolf, who retired to Warmond where he lived until his death in 1933. In the 1950’s Harm became a painter and ceramist of some repute He died in 1985. The illustrated letters of Harm Kamerlingh Onnes are published in Dutch, by Uitgeverij Verloren in Hilversum. The book has been edited by Dirk A.Buiskool. The name of Kamerlingh Onnes is a well known one. Its most famous bearer was Professor Heike Kamerlingh Onnes, who was Harm’s other uncle and elder brother of Dolf who was awarded the Nobel prize for physics in 1913 for reaching the fluid point of helium .